You will find them all over-be it at your cousin’s wedding, draped on the Hollywood diva at Cannes, the local Navratri get-together or at college functions. The net saree is here to stay and going nowhere. The sudden surge in designers, who have embellished and furthered the design palette and styles in net sarees, also has made them one of the most prominent of contemporary sarees, that has endured over almost a decade of frenzied wearing. So where does this popularity stem from? Net sarees in all cases, be it haute couture, high end or bought from the local market-look fabulous. They can easily bring to focus the embroidery, the crafts of needlework or any other form of embellishment. They are very easy to carry being light weight. Net sarees are as great on skinny women as they are on those well endowed and so its popularity across the board. And above all, being seen on some of the most prominent personalities, everyone wants a little chunk of glamour. This enduring love for net sarees has in recent times created gorgeous new designs, and draping styles. Here are some elements in your checklist before you decide on the style of net saree drape that would suit you. The choice of color-make sure that the color you choose to wear does adequate justice to the embellishment that is on the saree. Net sarees are worn so as to highlight the work on the saree and at the same time give you the appearance of frailty. Choosing the right kind of petticoat-that is the most important element in net saree wearing-the inner skirt must end at a point where it covers the ankle. Choose high quality fabric, preferably satin silk that will not clash but make the saree seem more dense and pretty in its color effect. Apart from the work that the saree itself hosts one must accessorize nets at all time-after all their very lightness is the reason why one prefers them. Try and match the cutch and the sandals with the jewelry worn. If the work on it is in gold, do opt for golden stilettos. The fitting of the blouse is of great importance as it is clearly visible through the net. Opt for sarees that tie up at the back –in fact, one could go for blouses that have work on the back, the sleeves as well as the front neckline. You could go for short jacket style silk blouses. Preferably try not to pleat the pallu of the net saree as it does take away a lot from its light feel and looks too rigid, which is much in contrast to how they are meant to make you feel. Wearing the saree too high or too low can be another area of contention-remember that each of us has her own style and if you have a svelte figure there is no need to be that daring-your slimness will be showing right through the net anyway. Keep you makeup limited to a few features. Like the saree itself –while its design shows off so starkly don’t overdress your face and let your most beautiful feature be the highlight. Here are my top picks and the draping style for all of you who love the sheer beauty of net sarees. Here the saree itself is an amazingly beautiful piece with heavy embroidery making the net much less see-through. As you can see-it is a normal drape but the palla has been left loose to hang down much below the knees. The main body of the saree has the heaviness of a lehenga and this is another concept in net sarees that could be explored. Note the very traditional high neck blouse and minimal jewelry-it’s the right balance struck as the saree is heavily embellished, the jewelry and make up has been kept minimal. The second style is the proverbial marriage between the lehenga, and the half saree look. The lower portion has been generously treated with brocade, so as to remove the more see-through aspect of net, while the upper portion and pallu has been given a thin border and has been styled into ‘nivi’ kind of pleating pinned at the shoulder. A highly traditional style that can be tried out by those who are slender built and can afford to show off their waist. Here is another sheer saree that anyone would love to own for its bright tropical colors and the vibrance it is instantly adding to the look. Very appropriately teamed with a kutchi blouse. The best part of course is the inner skirt that is in yellow, perfectly matching with the lower part of the color scheme. Since the blouse is heavily worked and the colors of the saree are all so eye-catching, the jewelry has been minimal-large earrings and some silver bangles on one hand. While the white saree on display here is a tissue, the same style could be adopted for draping a net saree. The front hanging pallu has been made possible because of the demure high necked blouse that contrasts vividly with the ivory on ivory work. It’s very elegant and stylish at the same time. It would suit special occasions where a top knot and some large danglers would complete the ensemble. The look that defies convention-net sarees are modern and contemporary as they are and those who dare to combine looks ,there can be nothing more interesting than this indo-western combination. The gold colored slacks does justice to the gorgeous work on the saree. The same draping style would look especially great with net sarees. 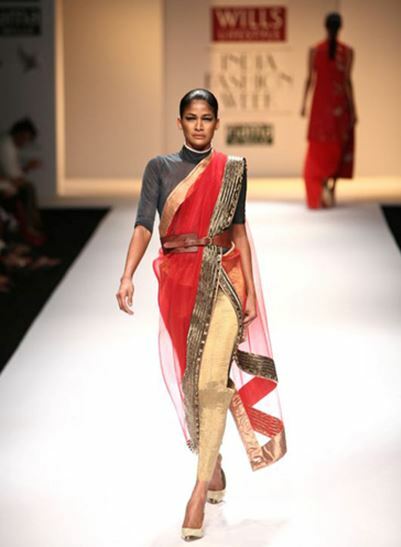 Here is another model wearing a net saree with a western styled pair of slacks. Another take at the loose pallu style that makes for easy draping-all one needs to do is that instead of taking regular five inch pleats, you make a froth of short pleats and tuck in at the center and then pin the pallu at the waist, where you can see the model’s hand. Use a classy saree pin and then let the rest of the pallu come on to the top and fall in longish length down to the floor. It is imperative that you wear an inner skirt that is made of good quality satin and has been ironed and made to look very neat.